About Spring in the Baltic. I very appreciate your kind comment. How the birds (and frequently their excrements) create ridicule and frivolity in the statues. VANITAS VANITATIS ET OMNIA VANITAS, as the Prophet said. Thank you very much. I value your generous and keen comment, Paul. I like this image. 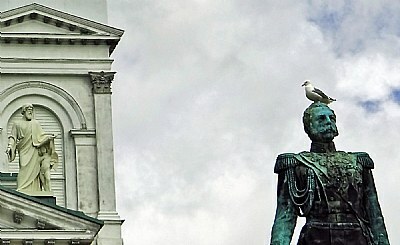 The composition draws attention to the bird on the statue and creates a sense of absurdity.